I am not feeling like there is much progress, but with this shawl I started placing a pin marker every time I work on it so I could SEE the progress. 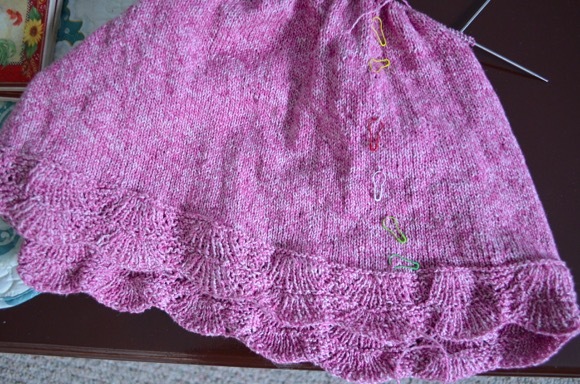 I remember when I started this in mid - May and my excitement to have a light and airy lace weight knit that could be easy to take with me on summer adventures.Now, I want to have this knit finished and sooner than later. I need to start knitting Christmas gifts in September. So the self imposed deadline is looming on all of my projects. I love knitting this summer top. 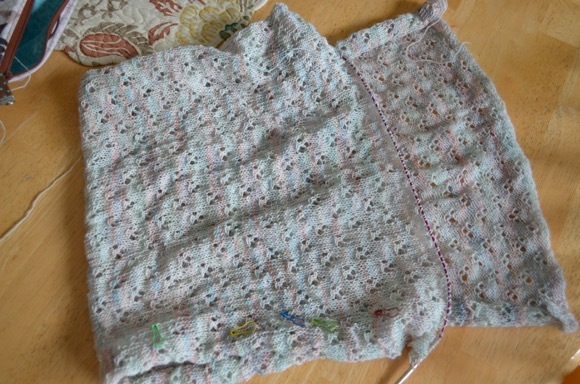 I finished the waist decreasing and have about 3-4 inches until the armhole. Easy peasy stockinette knitting is bliss! My son's blanket is over a third of the way completed. I have the pattern memorized and so I just dedicate an hour a day to add to the length. I wish I could cast on something new but I'm resisting the urge until one of the above three projects is off the needles. Wish me luck! What are you creating this week? Have you started thinking about the holiday season yet? I have started thinking about the holiday season. I have my list but need to check yarn supply to see if I have all that I need. I need to get started though because with canning season starting to be in full swing my time will be limited to evenings. Thank you for the inspiration! I have been fighting a serious case of castonitis. I really want to knit the second sleeve for my current bottom up sweater so I can figure out how the sleeves and bodice get joined before starting another sweater for a class that begins Aug. 18. The pressure is real. Three great projects! I look forward to seeing which one is off the needles first, and what you cast on as soon as you fulfill your promise to yourself. You can do it! I don't Holiday knit, so no worries there. I just need to get going on afghans and baby sweaters! Would you consider sharing that stitch pattern on your yet-to-b-finished shawl? Glad to see someone besides me works on more than on thing at a time! Hope your day is a great one! I love anything Heidi, have knit several sweaters of her's. I admire you sticking with the lace pattern, I would of bailed by now. Can't wait to see the finished product. And yes, darn it, Christmas is around the corner...again! Better get moving, I like to give hand made gifts. Yes my list has been made and I have made a start on my Christmas gifts. Your needles are always on fire, you knit so quickly. Those three projects will be off those needles in the very near future. 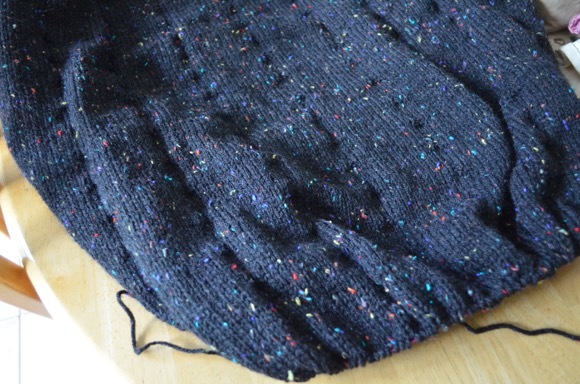 Sticking with a project through to the finish is a rewarding way to knit (eventually). It can become a little slog-like, but it is also the process, the process we love of creating knit stitches that create a whole. Knit on, Karen. Yup. I knit three ornaments on vacation! Super simple, use of leftovers. And Someone I met that is AL's friend is DONE with her Christmas shopping AND wrapping for 2018. If she wasn't just the sweetest thing you 'd ever meet I'd have to never talk to her again for being so organized! Best of luck Karen. Some one of these projects will be finished soon. 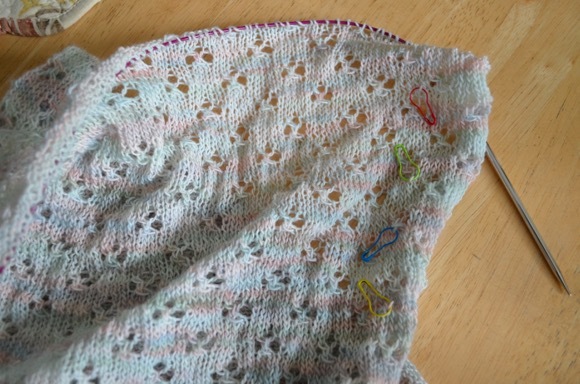 That little shawl is so sweet and the sweater will be a good summer top. And the blanket, of course, is full of love for your son. And so true, it is time to think about holiday gift knits. My sister and my niece, both knit-worthy have birthdays in November. Time to make a list. LOVE the top! Some how I missed the start of it and hadn't seen the pattern until today. I promptly added it to my Ravelry queue.